Cosaig 2 bedroom cottage is affordable, yet very well equipped and fitted out to a high standard. We have tried to think of everything so that you can travel light. With great reviews and so many guests returning to Cosaig time after time we think we must be doing something right! Fantastic place to stay, would highly recommend. Sleeps 4 – 6 (1 Bedroom with double bed and full sized single truckle bed; 1 bedroom with adult size bunk beds; sofa bed in living room). 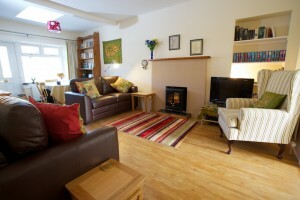 Cosaig is a delightful, fully modernised holiday cottage (built approx 1870) sleeping 4-6 people in the friendly and welcoming Scottish Borders town of Innerleithen, For more information see our page About Cosaig.